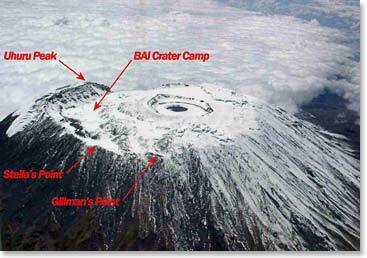 It's 6:30 in the evening and I'm calling you from inside the Crater on the top of Kilimanjaro at 18,790ft above sea level. Wow, the team did great today. 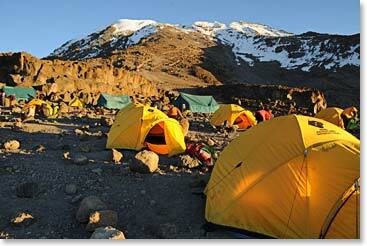 David Aisenstat and the Keg team just have 500 feet to go now to reach the very top, Uhuru Peak. We've made it this far and everyone is doing great. This morning, we had a beautiful sunrise at our High Camp at 16,000ft. 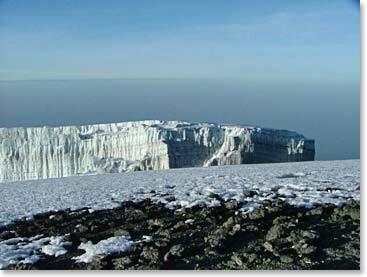 There was a bead of gold light that came up behind Mwenzi across from us at 17,000ft. I knew it was going to be a good day when I heard Led Zeppelin blasting our of David and Hartley's tent in the morning. We got ourselves ready and left in two waves, one at about 8:15am and one at 9:00am. 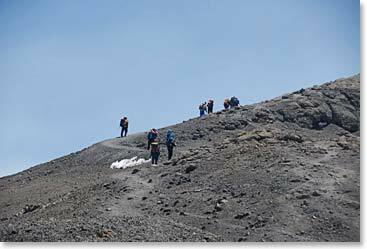 It's a long, long climb to the top of Stella Point on the Crater Rim. But the team stuck with it. One team made it at about 3:45pm and the other team made it to the top at about 5:45. The staff had a tent set up on Stella Point where we had a late lunch and we felt great about being on top of the world. We're a bit lightheaded in this thin air, but proud to have made it. Then we walked across the crater to our camp. It's very cold, the team has these great warm sleeping bags, though, and the staff is making some dinner and some hot drinks for us. 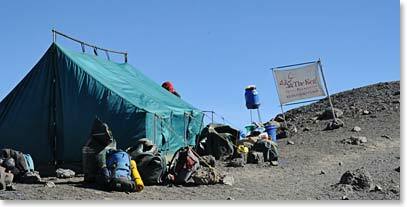 We'll be cozy tonight and tomorrow morning, with some luck, we'll be standing on the very summit of Africa! 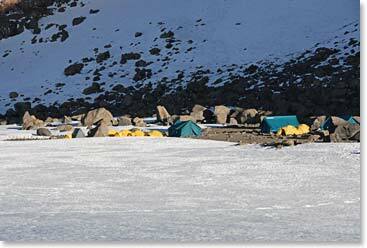 Berg Adventures private High Camp. You can see the trail to Stella Point and the summit.